Teachers College Press, 9780807756706, 192pp. Diane Ravitch called Susan Ochshorn "a tireless advocate for children," and her writing "brilliant." 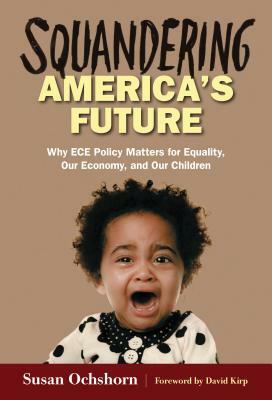 In Squandering America's Future, Ochshorn offers a pioneering guide to the big issues in contemporary early childhood policy. Written in a lively, personal style, the book drives home the importance of the earliest years for developing human capital--the nation's future. Her "policy tales" highlight the abject failure of the United States to support parents and early educators, the nation's real wealth producers, and will inspire a new generation of leadership. With her 360-degree view, Ochshorn boldly and clearly shows how early care and education is an issue of social justice that also impacts America's ability to compete on the world stage. An irreverent, illuminating, firsthand account of the promise and perils of ECE's ascendance to the top of the national policy agenda. An accessible introduction to the big issues in contemporary ECE policy for students of early childhood education and public policy. A straightforward look at the effects of push-down academics on children's healthy development, including the critical ability to play. Historical, social, and cultural obstacles to achieving equity for young children and their families. Profiles of innovative initiatives and the people who are making a difference across the United States. Susan Ochshorn is the founder of the consulting firm ECE PolicyWorks. A former journalist, Ochshorn blogs at the Huffington Post and ECE Policy Matters, the go-to place for early childhood teachers, those who train them, and the decision makers who determine their professional course.